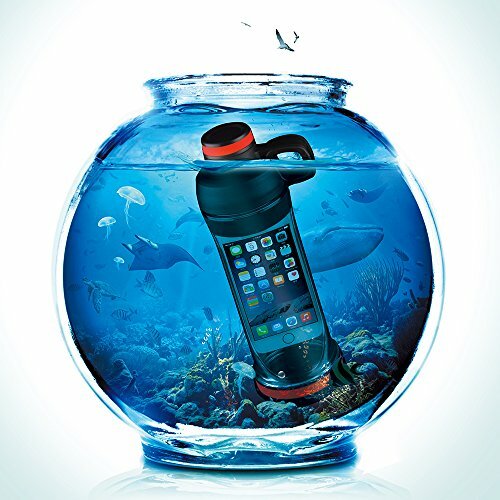 iPhone Water Bottle - Moar Stuff - You don't need it but you know you want it. Multi-functional Application: It can be used in Car, Sports, Gym, Yoga. 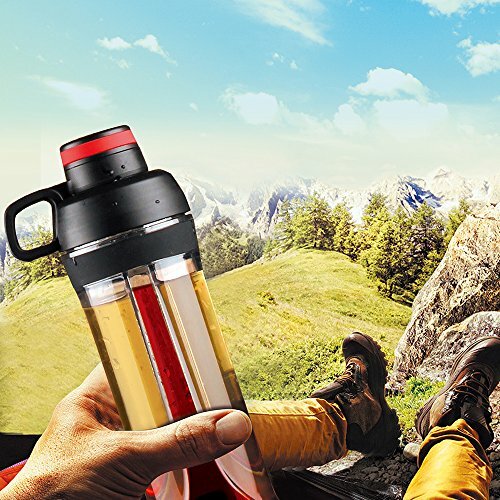 Smart bottle is best choice for you in daily life and outdoor activities. Stylish and Convenient: A water cup can solve some problem that of your mobile phone, keys, medicines, small change and the kettle. ATTENTION: The design philosophy is fit for the iPhone 6/7 and iPhone6s/7s (the screen size is 4.7inch). If the clearance too little, the phone will be shaking in the process of the sport and will be collision. So first you should remove the case, then you will out the phone into the water bottle. 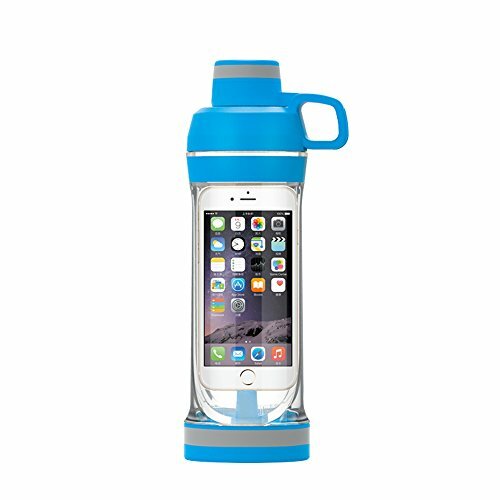 This iPhone Water Bottle is perfect for when you’re doing yoga, running, bicycling, hiking, or doing active activities. Mainly because you often cant easily carry (and keep track of) bring both a water bottle and a smart phone when you’re exercising. Naturally, you’d like to bring just the thing that’s going to keep you alive throughout your workout, which is of course your iPhone. Anyway, with this iPhone Water Bottle, you can slide your 4.7 inch iPhone right inside of it, so you can carry them both with ease. Better yet, you only have to keep track of one item to have them both. 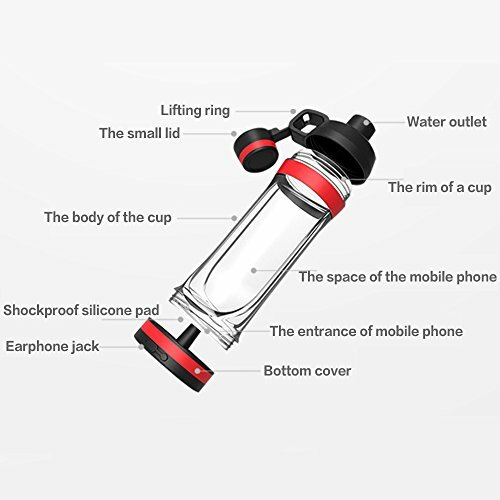 The iPhone water bottle has an opening on the bottom of it that you can unscrew and insert your iPhone and other small essentials like money, a key, a tiny snack, etc. These items will then have a water tight seal against the water that goes in on the other side of the water bottle. Oh, do you like to listen to your music when working out but, haven’t sprung for wireless earbuds? No problem, the end cap has a pass through so you can use your regular headphone. Cool, huh? OK, so here are the catches…. First, it will not work with the iPhone 6 Plus or iPhone 7 Plus. They’re simply too big. Also, even with a regular iPhone, you might need to remove your phone case to make it fit. This is intentional as it needs to be a tight fit to keep your phone from rattling around and getting damaged. Dimensions: 12 x 3.3 inches. Water Capacity: 13.5 oz. (about 400 ml). Compatibility: Designed for the iPhone 6/7 with the 4.7 inch screens. The bottle opens from both sides, leaving no space for mold. High temperature resistant 14℉ – 230℉ but, NOT microwave safe. It should work with similarly sized Android phones but not the iPhone 6/7 Plus models. They’re too big.